Well hello to you my reader chums! I hope you all had a lovely Christmas and are excited for what the new year will bring. It's crazy to think we're in the last day of 2015; the past 12 months have been an absolute whirlwind, filled with countless unforgettable memories and treasured moments. For today's post, I wanted to share with you the beauty items I picked up when I was at Bluewater on Monday. My twin and I have this tradition where we go to Bluewater a few days after Christmas to hit the sales! As we like to spend Boxing Day at home chilling with the family and munching on all the leftovers, we like to have our shopping trip a few days after, this way the crowds won't be as hectic! Shopping trips are my absolute favourite thing. We managed to go round the whole of Bluewater, purchased some gorgeous bits over the course of the day and finished it in Jamie's Italian, where we enjoyed a truly scrumptious feast. The beauty products I picked up, I'm very excited to try out! 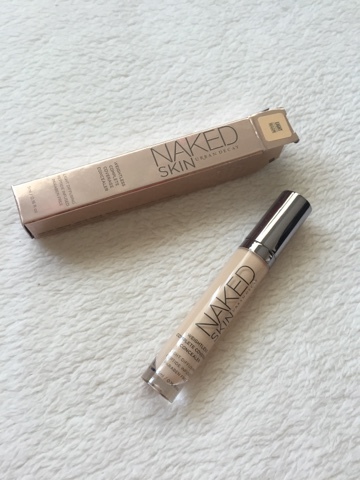 Urban Decay's Naked skin concealer: Out of all the things I bought, this is certainly the one I'm most excited about. I've heard many bloggers rave about this concealer and a few people telling me on Twitter I need to give it a go, so I did. Initially when I went to the Urban Decay counter I was going to splurge on a new eye shadow palette, however I thought instead I would treat myself to some high end face products, as I don't change up my base routine on a regular basis nor have a tried various concealers. After swatching a few, I asked what shade would be best and the lovely lady recommended 'light warm', a more yellow toned shade. I just want to take a moment to appreciate the packaging, it looks incredibly sleek and extravagant, let's hope I adore the concealer as much as the design! 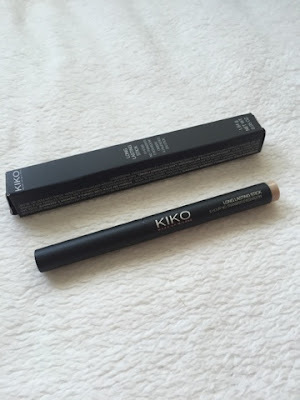 Kiko lip liners in 304 and 315: One of the first shops we headed to was Kiko cosmetics, an Italian affordable makeup brand because I've heard loads of good reviews on their products and therefore was intrigued to get my hands on some. 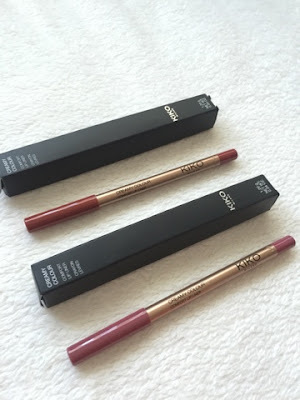 After browsing for a while, I came across these gorgeous lip liners, which were absolutely beautiful when I swatched them ( see below.) 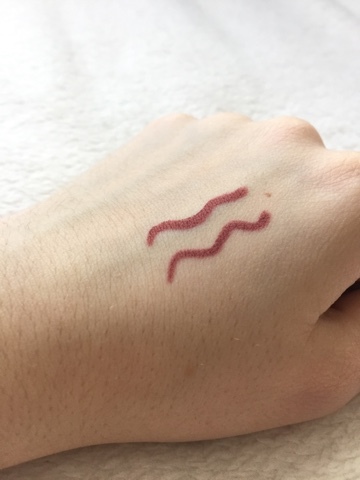 Despite being a complete lipstick hoarder, I've never been one to apply lip liner before lipstick and thought this would be the perfect opportunity to try some liners without breaking the bank. The quality of them is stunning and I love the shades I chose - 304 is a red toned, pinky brown colour and 315 is very similar, yet slightly more pink and plumy toned. This is 304 on the left and 315 next to it - as you can see, very similar, 315 is slightly darker. 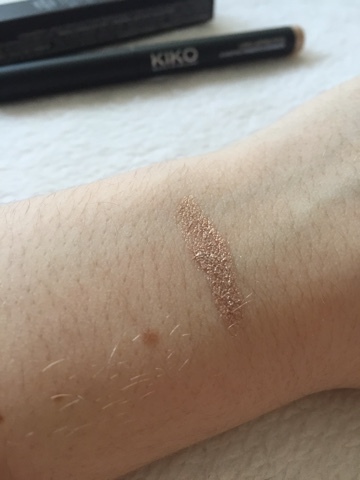 Kiko eye shadow stick in '07': As gold shadows are my absolute favourite colour when creating an eye look, you can imagine once I swatched this, I was in make up heaven. It's a beautiful, pigmented shimmery gold shadow stick, designed to wear as an eye shadow base. The colour is incredible, a sparkly gold that isn't too shimmery with a creamy consistency, ideal to blend all over the lid. I can't wait to give this a go when wearing a gold smoky eye because I reckon it'll bring the gold colour out much more. From the image you can tell it holds a slight bronze undertone with a true, strong gold shimmer running through. 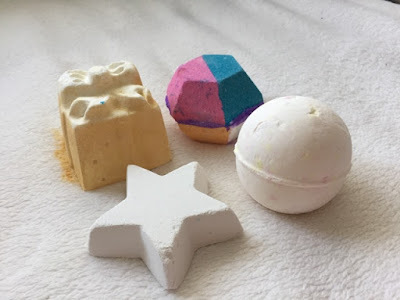 Lush bath bombs: No beauty haul is complete without a purchase from Lush. They had a Christmas sale on where I managed to get two bath bombs from the range for only half the price - Golden Wonder and Star Dust. Golden Wonder is my favourite Christmas bath bomb, I love the smell and all the colours that shine through, especially that heap of glitter you're left with at the end! Unfortunately they didn't have any Luxury Lush pud bath bombs left, however I'm excited to try out Star Dust. The other two I bought were Dragon's Egg, my absolute top bath bomb of all time, you're on citrus heaven with this beauty and The Experimenter, a complete colourful rainbow bomb! 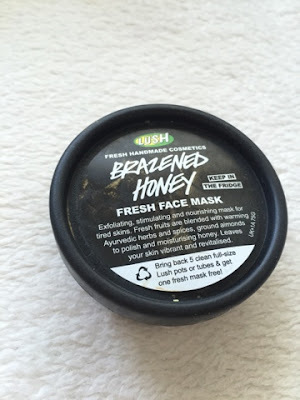 Lush's face mask in 'Brazened honey': The last purchase is a must every time I go into Lush and it's their face mask in 'Brazened Honey.' This is my go to face mask I love to use about twice a week because it's done wonders for my skin, leaving it feeling fresh and silky smooth - I'd definitely recommend. I hope you enjoyed this beauty haul post. Have you bought any beauty bargains in the sale? Oooo you got some lovely bits! Those kiko liners look brilliant! You got some great bits! There is a Kiko Milano near me so I am desperate to try some make up from there! I also LOVE Dragons Egg sooo much .. Definitely on of my faves to watch ! That shadow stick is in such a lovely shade!